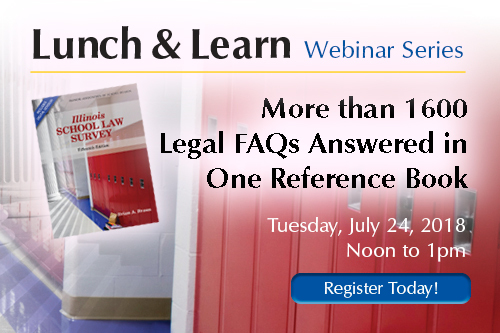 IASB will host an upcoming webinar with Brian A. Braun, author of the Illinois School Law Survey, to explain how school officials can best utilize the reference book to answer new and common legal questions. Braun, an attorney with Miller, Tracy, Braun, Funk & Miller, Ltd., will walk through the ins and outs of the Law Survey, which contains answers to over 1,600 questions based on legislation, court decisions, and administrative rules and regulations. He will discuss some of the notable changes that were included in the current edition and go over how the publication has evolved since it was first published nearly 30 years ago. One reason board members and administrators often refer to the Law Survey as an essential resource is the book’s ability to explain difficult and complicated issues in layman’s terms. During the webinar, Braun will pull examples of the tough issues districts are currently faced with, such as how court decisions have impacted exclusive bargaining and union contract provisions, what accommodations must be made for transgender students, and recent legal changes that impact school discipline rules. Using these examples from the new Fifteenth Edition he will explain what information is contained in a question-and-answer entry and how it changes over time as laws change. 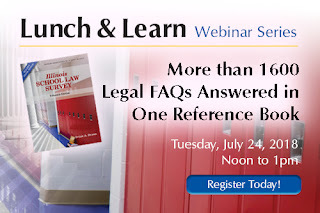 Braun will present the hour-long Lunch and Learn webinar beginning at noon on Tuesday, July 24. Registration is available by visiting the IASB website, and selecting the blue Online Learning tab at the top of the page. The Illinois School Law Survey may be purchased online at the IASB bookstore.